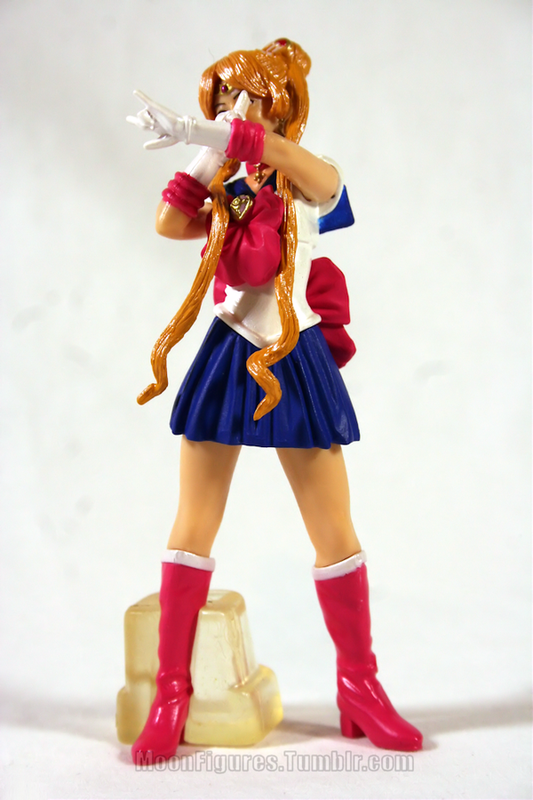 Live Action PGSM Gashapon Set – MoonFigures Collection, Art, and Reviews! Please excuse some of the photos in this review. The entire thing has taken me roughly 3-4 days to put together, and by the end of photo taking and reviewing I kind of got fed up with the repetitiveness. If there is something I’m missing please ask! I’ll answer you and even add it. 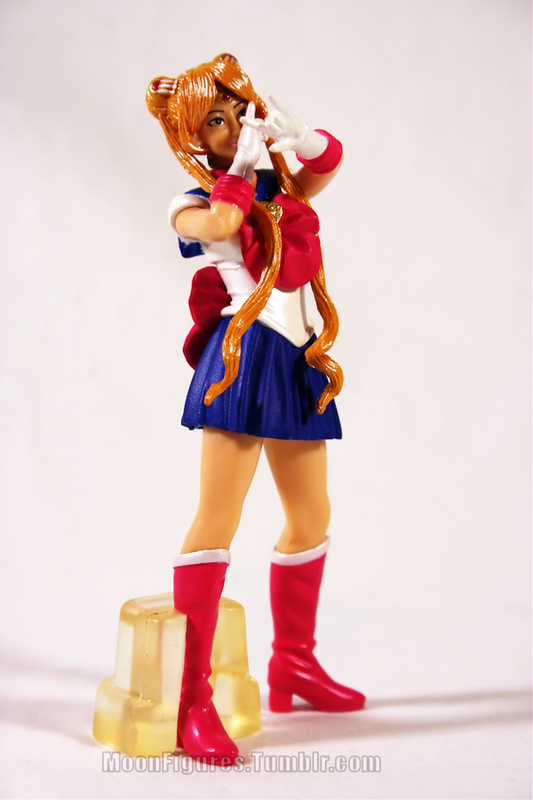 Pretty Guardian Sailor Moon, aka PGSM or Live Action Sailor Moon is a well known adaption of Bishoujo Senshi Sailor Moon that aired on Japanese television from October 2003 until September 2004. PGSM is usually loved for its quirky cheesiness, and all of the things that similar 90’s Japanese Live Action series brought to the table. 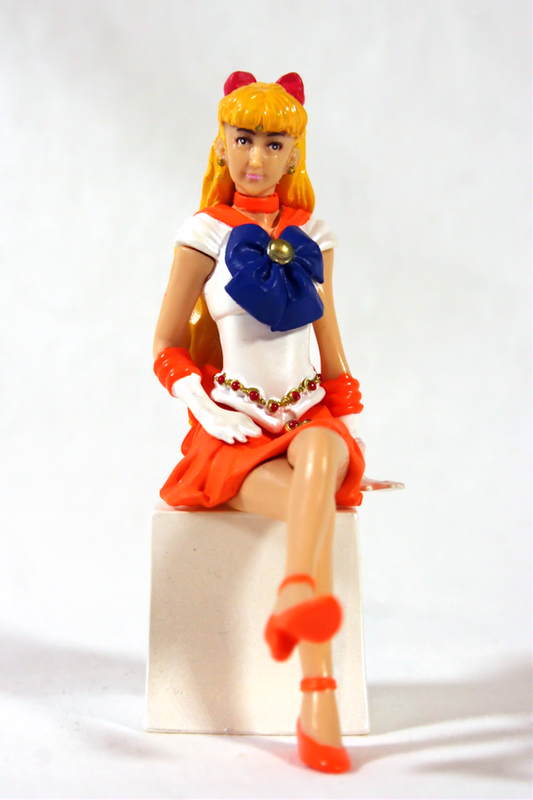 Despite being based on the manga and anime versions of the series the Live Action also brings its own plot points and character transformations, most notably a condition with Sailor Venus and Sailor Senshi transformation of Luna. Don’t let the silliness fool you though! PGSM has its fair share of tear jerking moments as well. 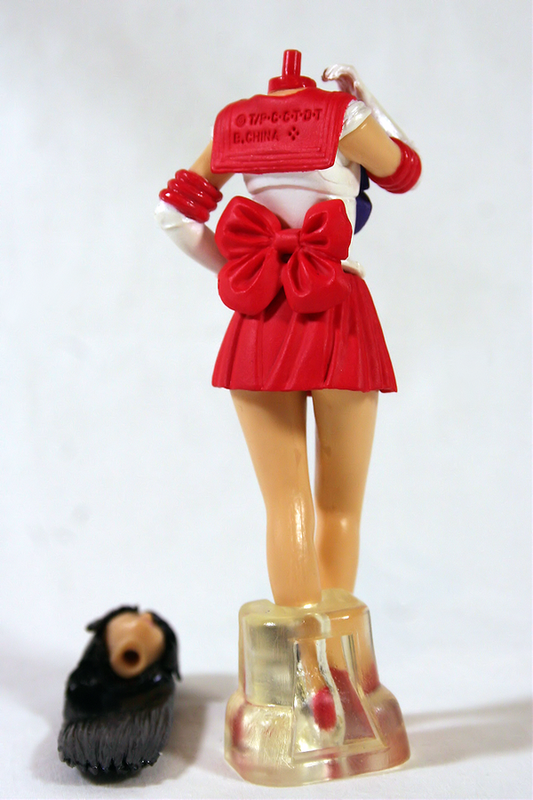 This is the cardboard ad that was displayed in the gashapon machines when these figures were for sale. The paper slips are below (click to see large files). As you’ll see in my review the figures vs the advertising for these figures is completely inaccurate. 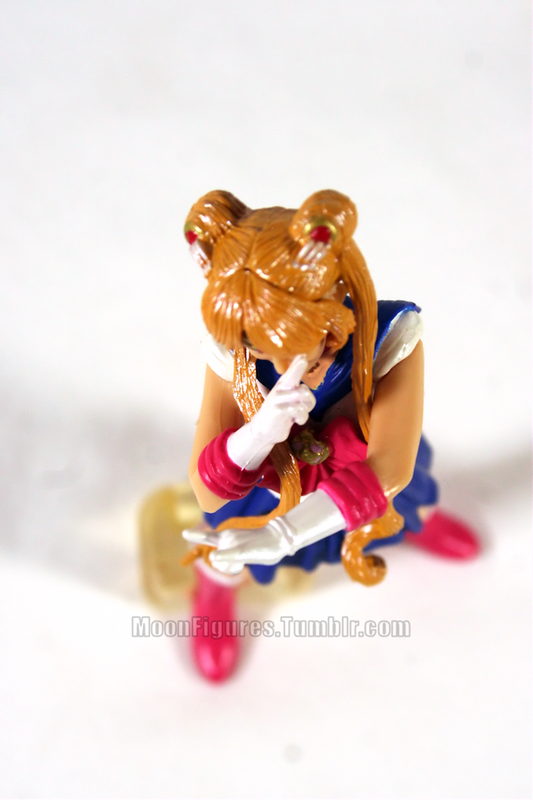 These figures are not popular and are the cheapest set of all of the Sailor Moon gashapon on the second hand market for various reasons. I feel the advertising material for this figure is completely misleading in regards to the visual aesthetics of these figures and tries making up for where they lack. 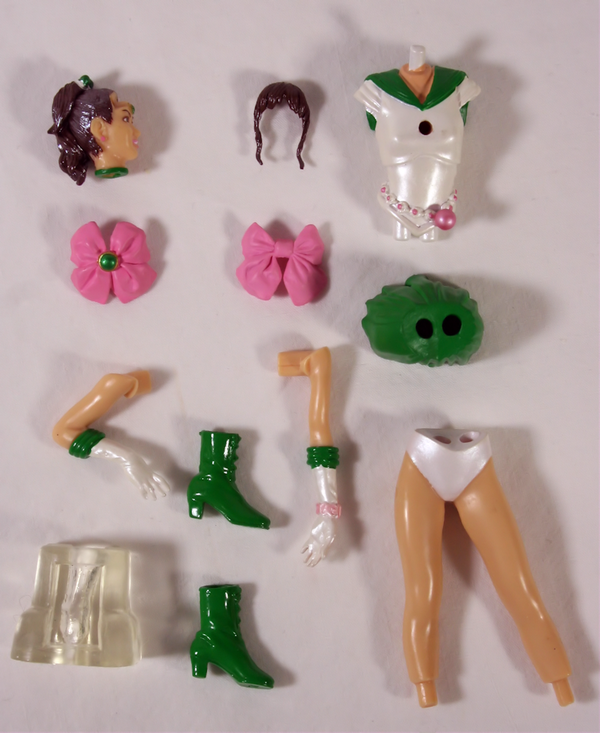 Sailor Moon comes in 13 easy to assemble pieces (possibly 12, her bangs appear to be removable, but they appeared to be super glued). 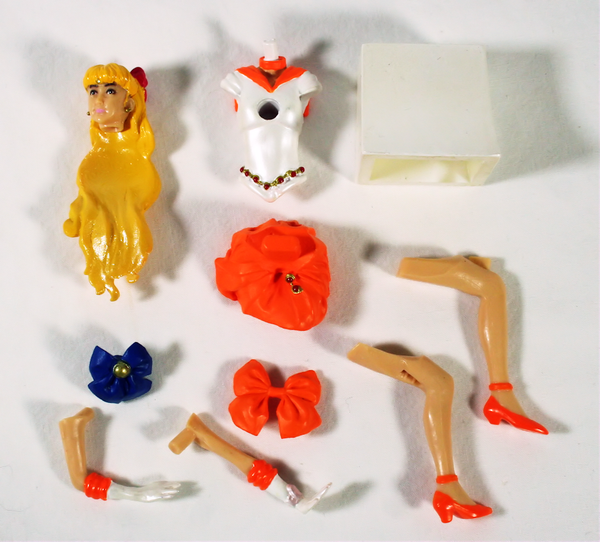 Like most Sailor Moon gashapon the pieces are rarely tight, but JUST under sized so that you can’t really pick them up and play with them because they fall apart. This is mostly an issue along the body, so there are issues at the waist and neck, but I find her boots to be the most difficult. 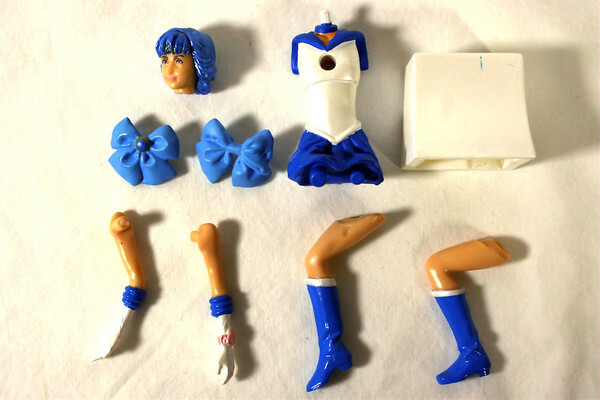 Sailor Mercury consists of 11 pieces (after Sailor Moon I didn’t want to pull her head apart just in case it had trouble going back) that fit similar to Sailor Moon. The pieces slide together easy enough, but when picked up they also tend to fall apart. 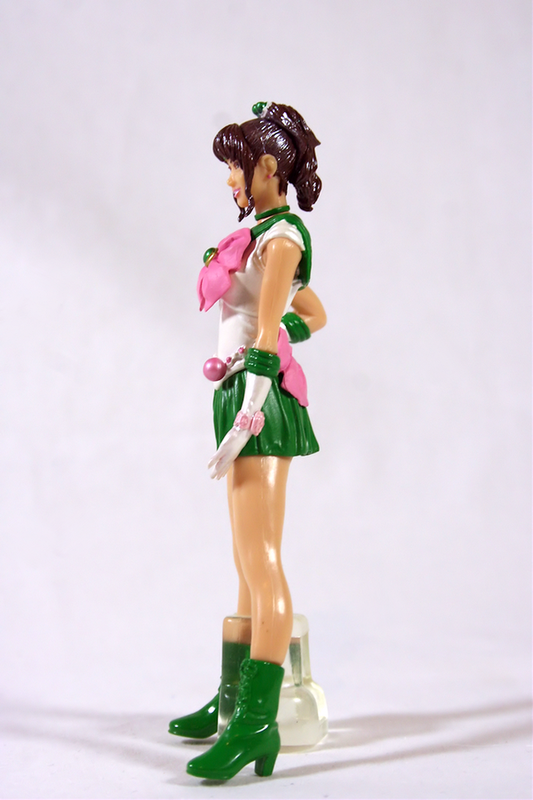 As her body doesn’t separate at the waist like the rest of the figures she does hold a TINY bit better. 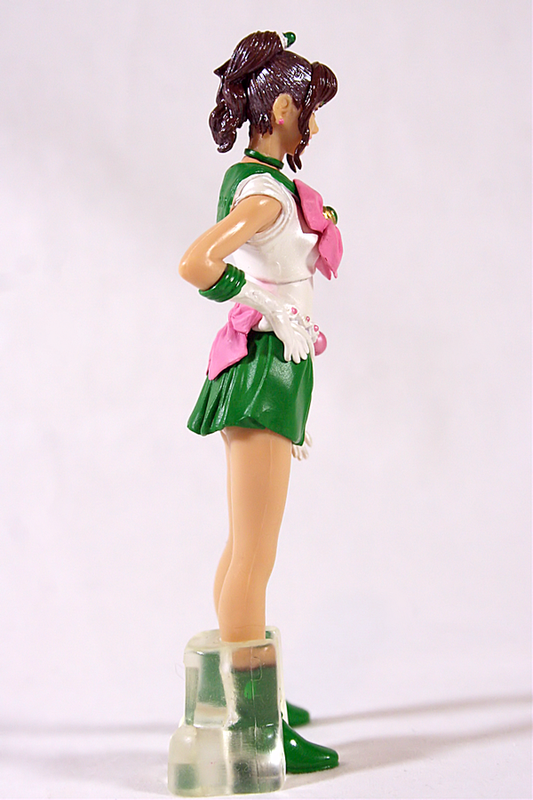 Her legs do have a habit of shifting and causing issues with the pose though (as you’ll see in photos). 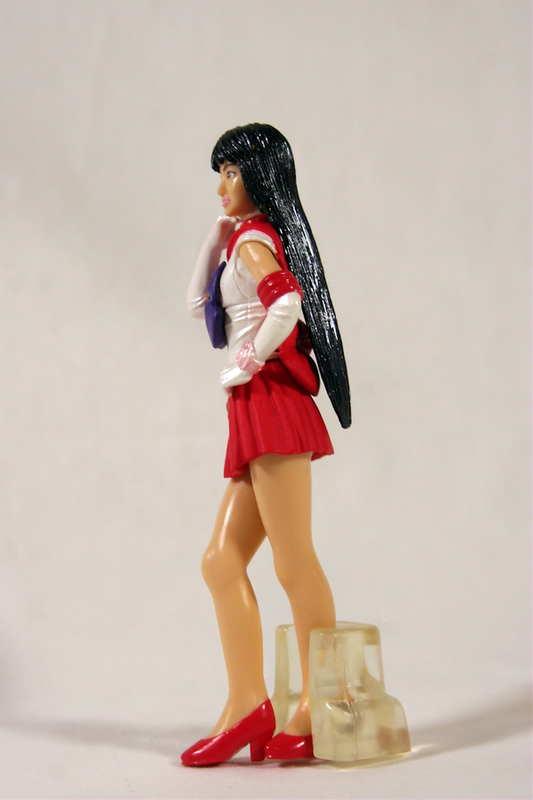 Sailor Mars consists of 12 pieces. 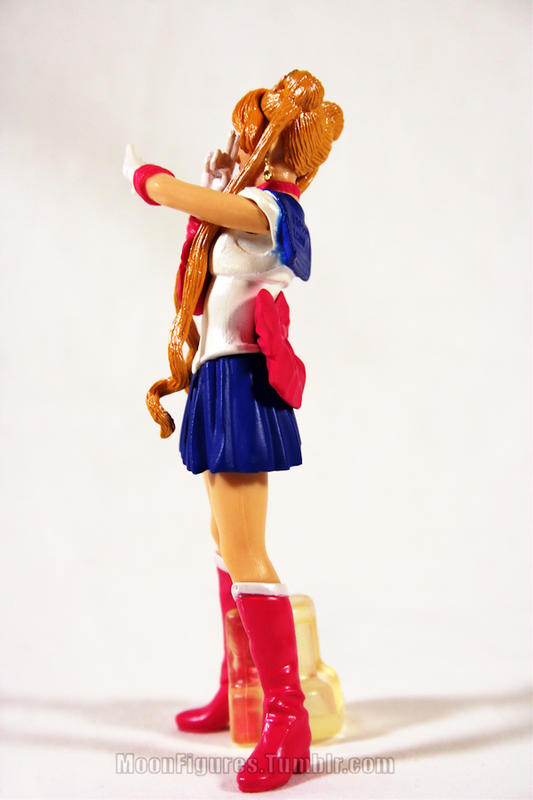 Fit is the same as Sailor Moon. She tends to let go at the waist when being transported. Her base, although it holds her up just fine, will come loose when she is being moved. Her head also seems a little tight fitting. It is possible to push it down all of the way, but it’s easy to accidentally leave her with a small gap. There are lots of folds, the hair is supremely detailed, and, my favorite part about them, they’re unusually thick because of their much more realistic proportions compared to their anime counterparts. Because the hair is what detracts from the entire figure, but the rest seems ok I’ve given them a score of 7/10. For over all appearance based on sculpt I’d rate them a 5, but I feel unfair scoring them low based on 1 piece that looks off… even if it’s in such an important area as the face. 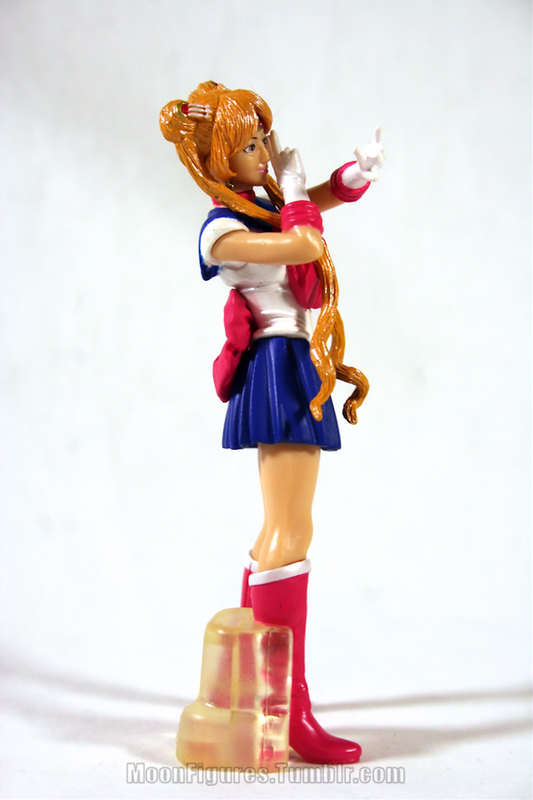 Sailor Moons pose could also use some work. While at first it appears to be her standard Oshiokiyo pose (and it is), her hands are much too high and in her face to make the figure aesthetically pleasing on a shelf. She has to be placed on a lower shelf to see her face properly or at a strange angle. As she should be as realistic as possible for the series she is most likely posed this way because that’s how the actress posed, but it just doesn’t translate nicely. 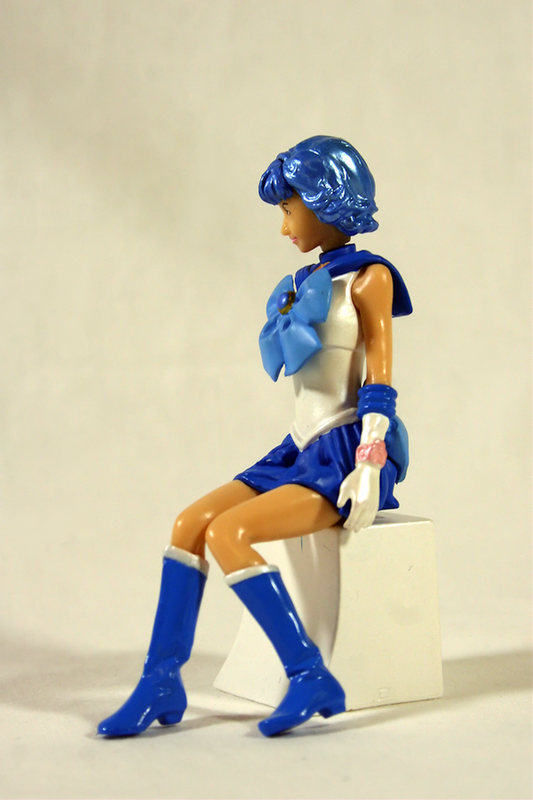 Sitting Mercury on her base is a difficult task though. Her legs have to be pushed in just so for her hand to sit perfectly on her seat. 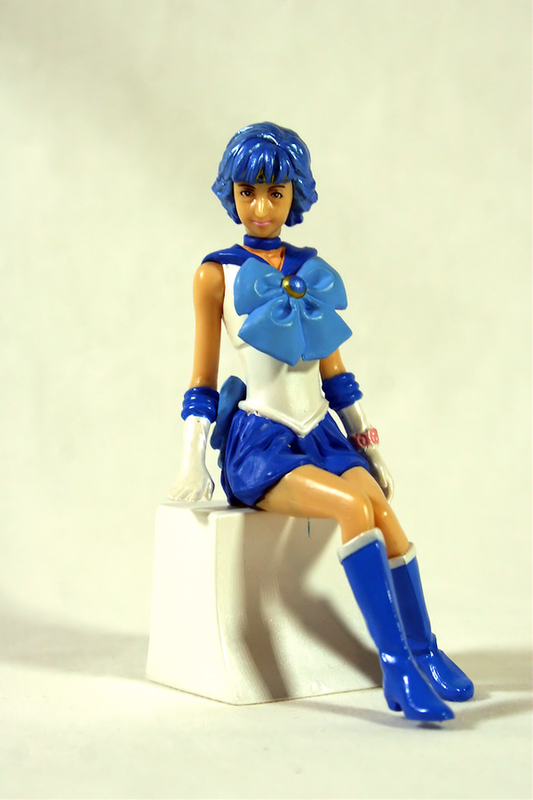 This doesn’t really take away from the overall display of the figure. It’s hardly noticeable when displayed. 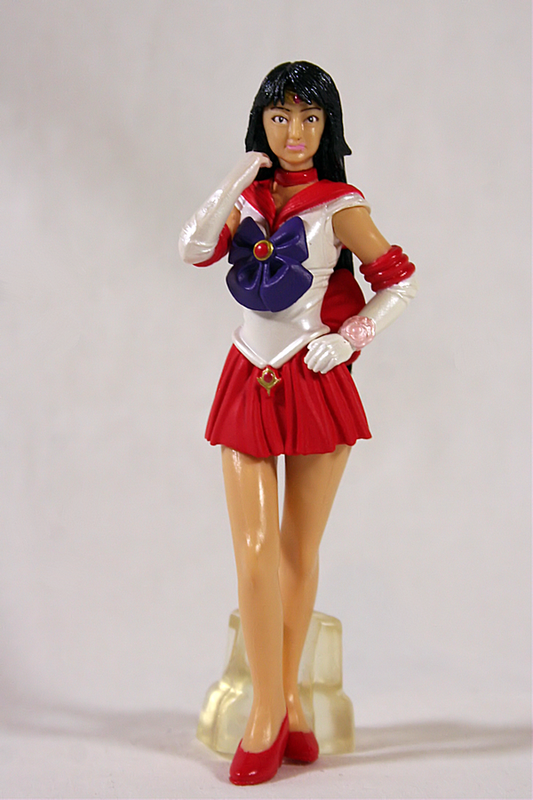 Sailor Mars deserves the same praise for the sculpt of her body as the rest, but there are some concerns with her that either aren’t as evident with the others or don’t exist. First, lets get her hair out of the way. 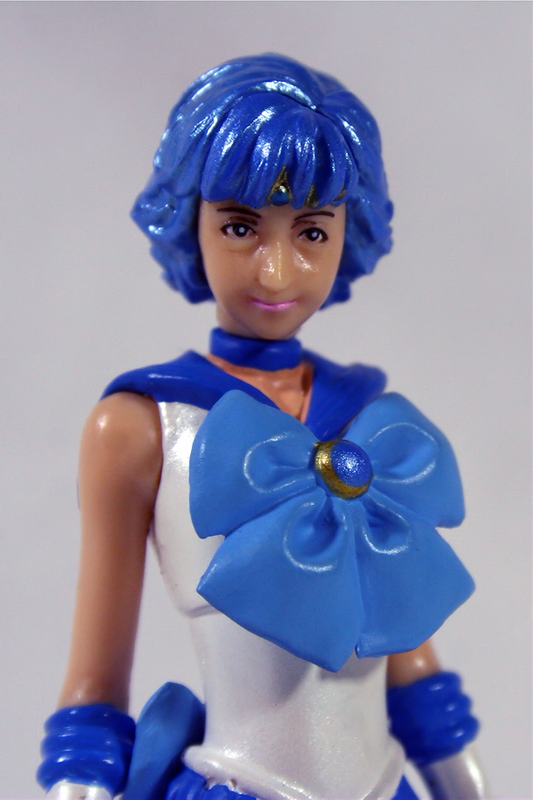 The “wig effect” doesn’t appear the same way on Mars as it does on Sailor Moon and other figures. Her hair appears flat and almost dirty looking. Her long strands are thin and semi-transparent. The next issue is with her feet. 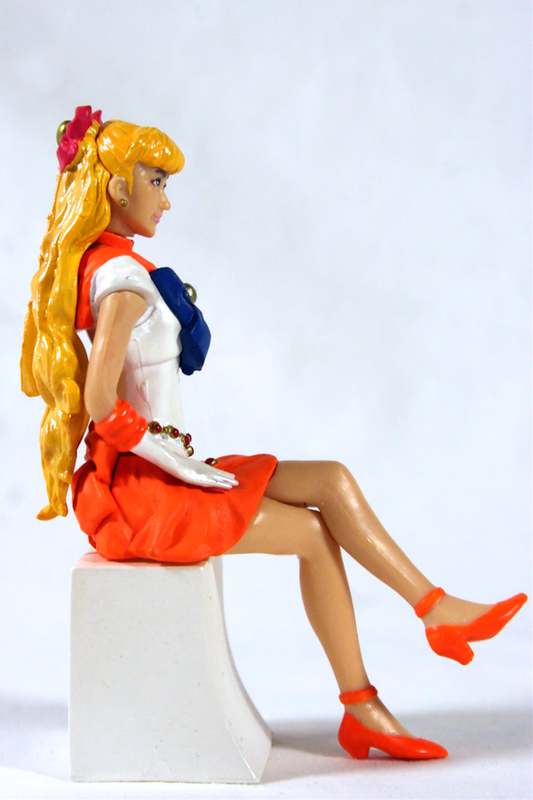 They’re large compared to the rest of the figure, and while real feet CAN be large the actress actually appears to have rather small to average feet. 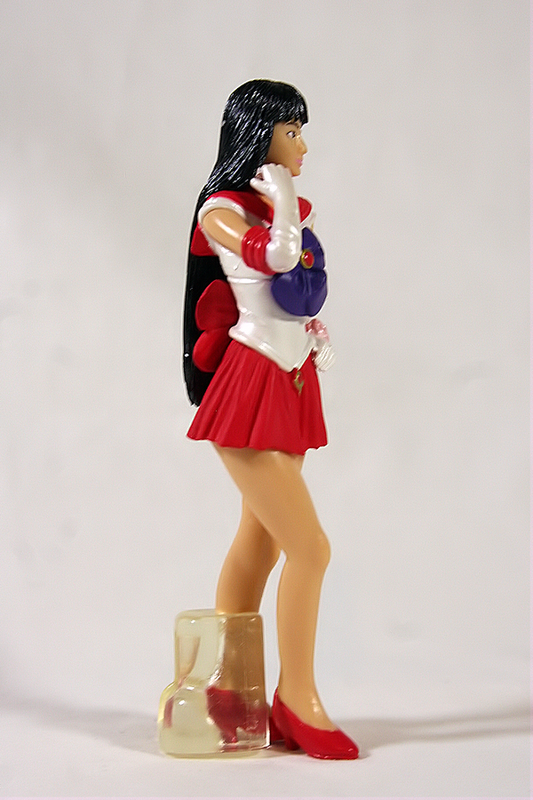 It’s a minor issue, but in comparison with the others it is noticeable as she wears heals rather than boots. This also appears to continue up the leg, making me wonder if they just used one of the girls wearing boots as a template and shaved off the fabric folds. Last, is her face. The sculpt on this one isn’t so pretty. I hate to break form, but I spent most of the time I edited pictures laughing at how I think you could probably put her face on a little old lady figure and she’d look like a grandma getting angry at small, hyper children for being too loud. While the expression is suitable for the character, the execution of it is not. It’s poorly done and close to old and disfigured looking. 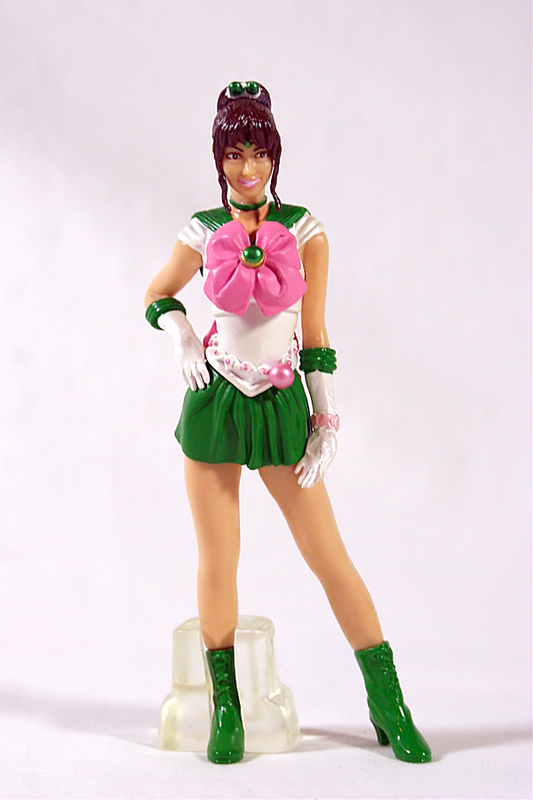 Jupiter is by far the best sculpt in this series. Her hair works, her proportions work, and her face doesn’t look horrifying with her hair. The fabric falling flat against her leg is a nice touch as well. 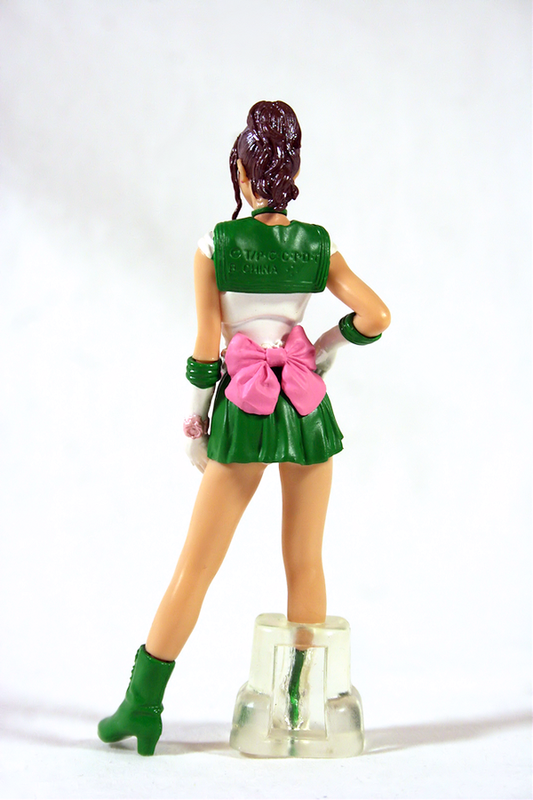 The only real issues with her sculpt is in the round thing on the belt she wears on her waist. It should be a ball containing 2 roses. Instead they opted to just awkwardly place a ball on her waist. 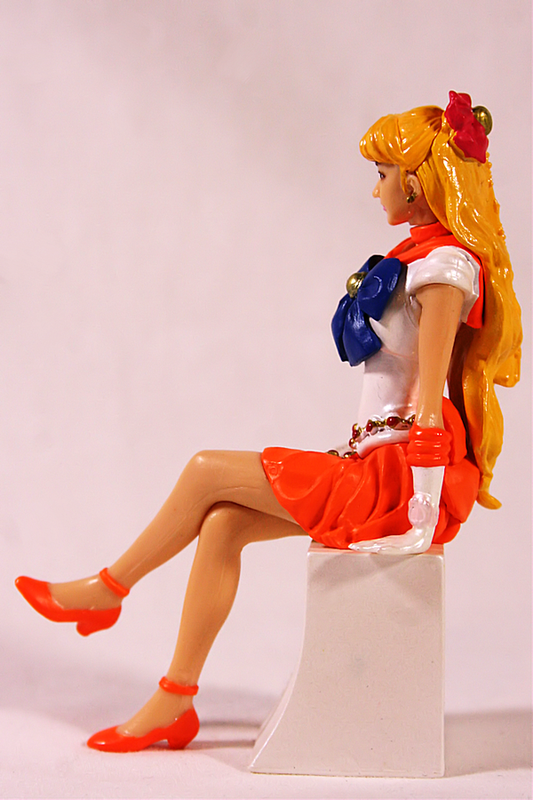 The details in her skirt and boots kind of make up for it a tiny bit, but it would have been nice to see them sculpt a rose instead. 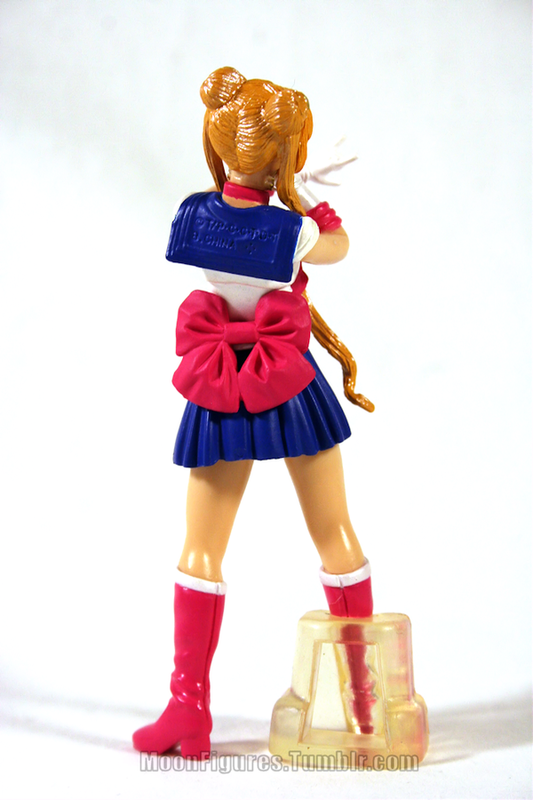 The pose works for Jupiter pretty well. It’s strong and sassy, but her left hand seems a little out of place and unsure of what it should be doing. Is she teasing the viewer? Taunting a Monster of the Day? Or is it just… there? 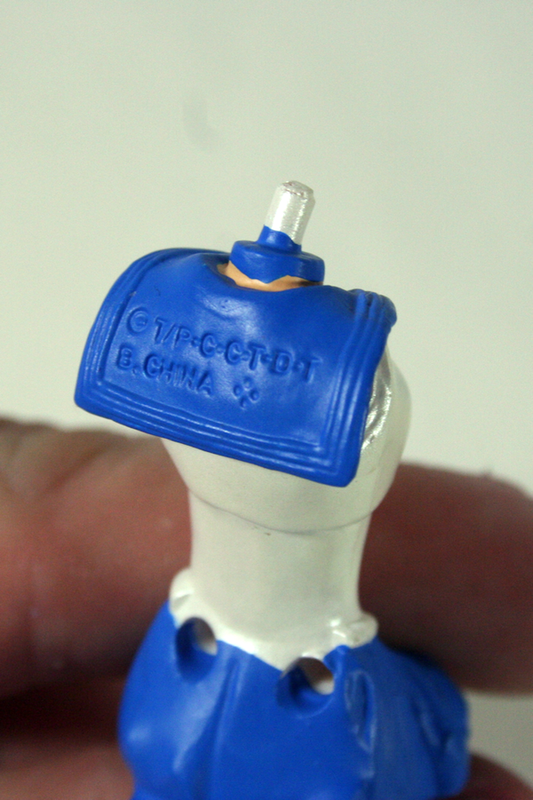 It appears it should be a removable piece, but it’s factory glued into this position. The advertising shows it facing in towards the leg (I’ll fix mine later). 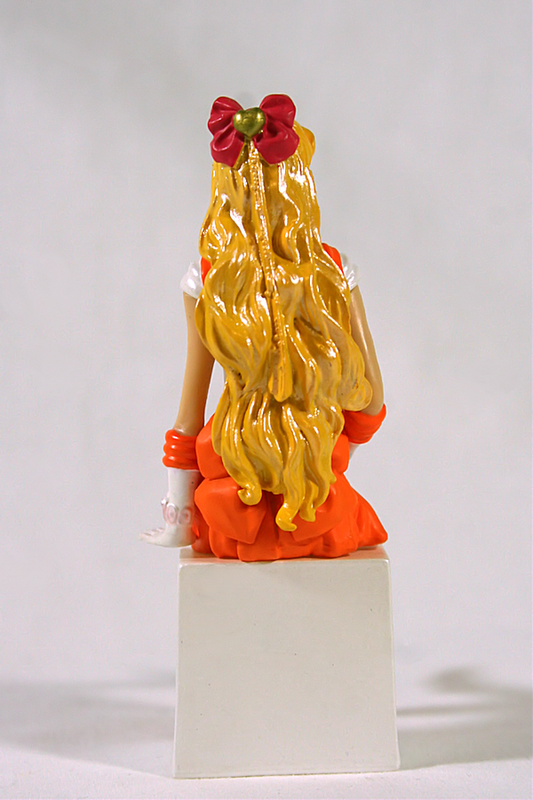 In regards to the issue of “wig hair” Venus, although second to Sailor Moon’s, is one of the worst in the set. Her bangs, although accurate, reach out over her eyebrows. The bangs don’t just look big, but they make her face look off and manly. The hair-do looks fine on the actress, but it just doesn’t translate well to figure. Venus’ pose feels less casual than the others, and her facial expression tight. She isn’t smiling, but her head is tilted slightly. It’s not clear if she’s suppose to fit with the group, or appear slightly out of place as would be in character. In regards to her other details she’s actually quite beautiful. Her accessories, and flowing hair down her back are beautifully done, especially the braided piece. 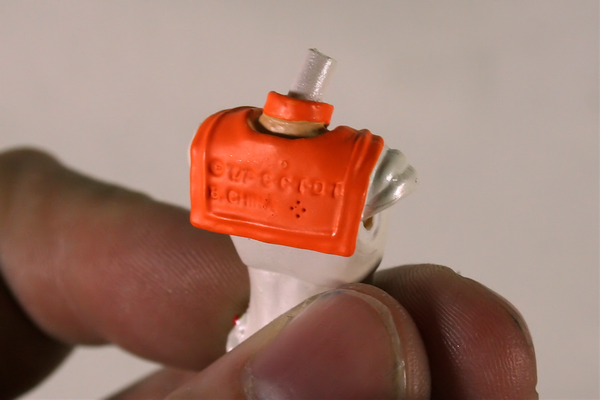 It’s a shame the rest of their heads are so odd… or perhaps I’m just too use to anime figures? 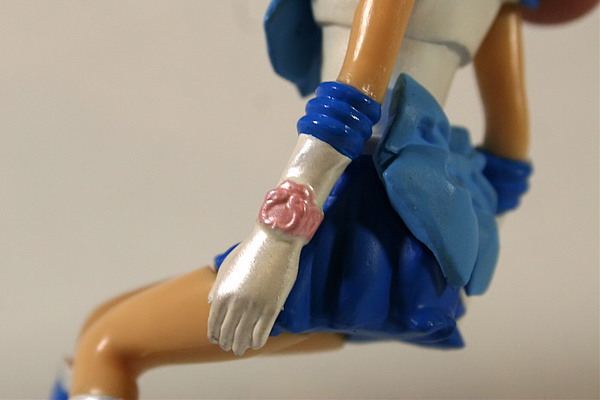 Sailor Moon’s paint job isn’t horrible, but it has a few areas that don’t match or appear lazy. 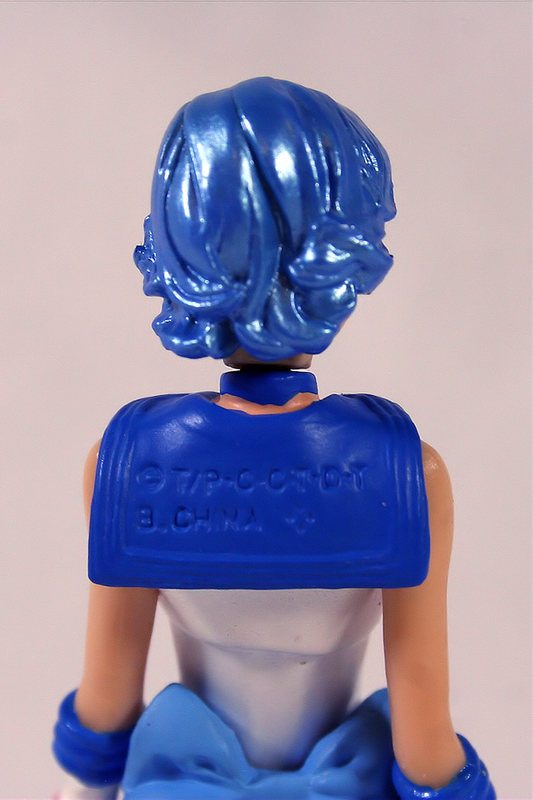 The back of the neck doesn’t match the rest of her skin tone. It appears they painted all of this space either red or blue (or both) and then they painted the skin in later, despite it appearing to have already been moulded in the proper skin tone. The arrow pointing to her collar is actually pointing to the copyright information, but lets pretend that it’s pointing to her stripes. These aren’t painting on, despite being sculpted. 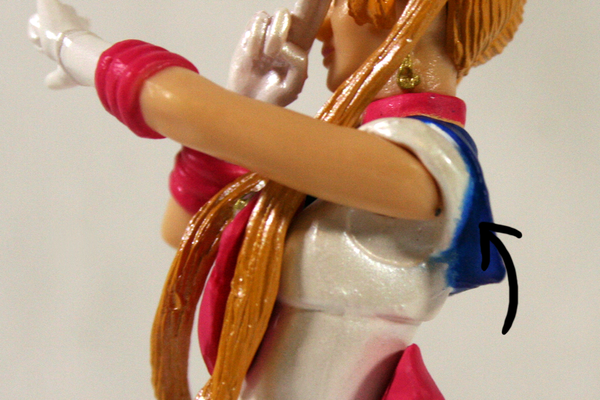 Both pictures above are of the paint on the transitioning area of Sailor Moons back and collar. No one ever seems to know what to do with this area. It’s either messy (as seen above), or clean cut, but still awkward because it’s thick, instead of portraying the thin piece of fabric that it should be. 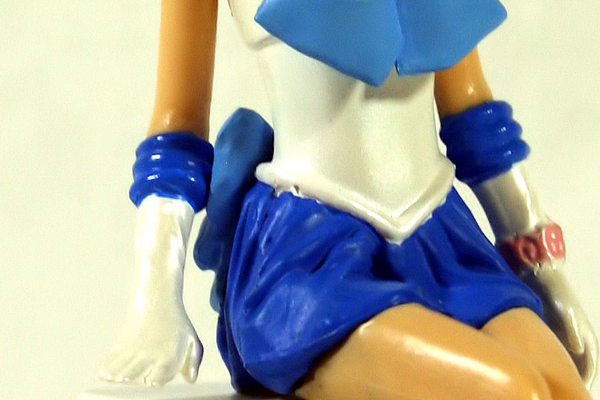 It could be worse but there is some white overlapping what should be blue skirt. 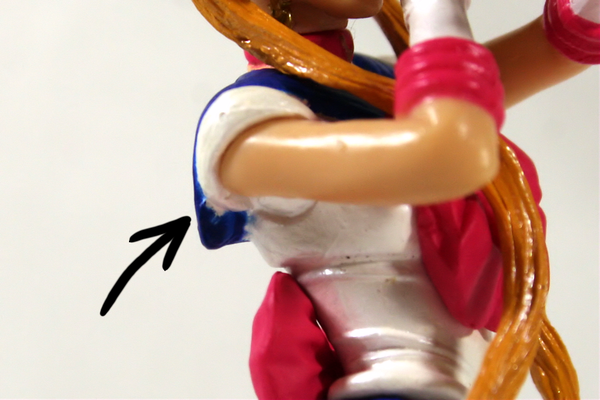 There’s also an issue with the sculpting vs paint on the left side that makes it appear as though there’s a chunk missing instead of it being a fold/pleat in her skirt. 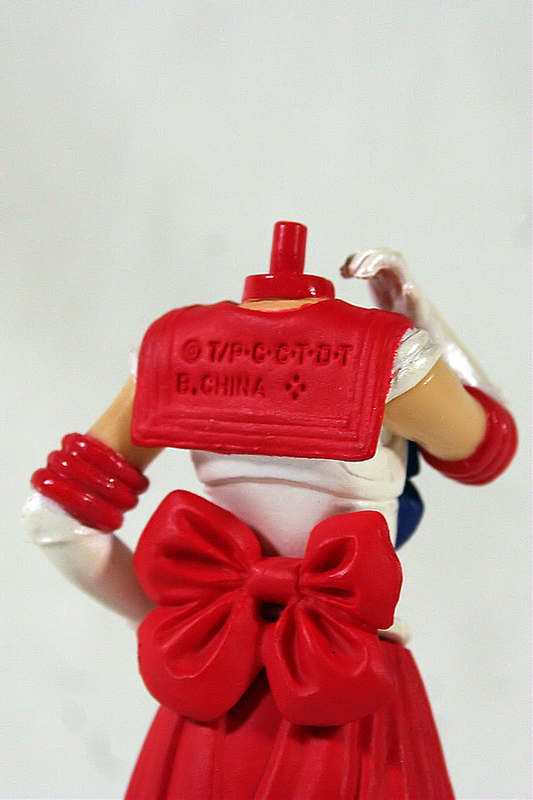 See back of the neck and skirt where the bow should be. They tried matching skin tone again and failed. Well, maybe not failed. It appears they have a generic skin tone that doesn’t match their figures. Mercurys hair is an interesting metallic blue. It’s unclear as to why they went with metallic as opposed to light blue. It somehow works, although it should be a lot more ridiculous. In general her face is alright. For regular viewing it appears fine, but on mine you can tell in the photograph that one eye is slightly lower than the other, and one of the eyelids shading is painted rather sloppy. This isn’t as noticeable for regular viewing. In fact, I never noticed it until I was editing photos. 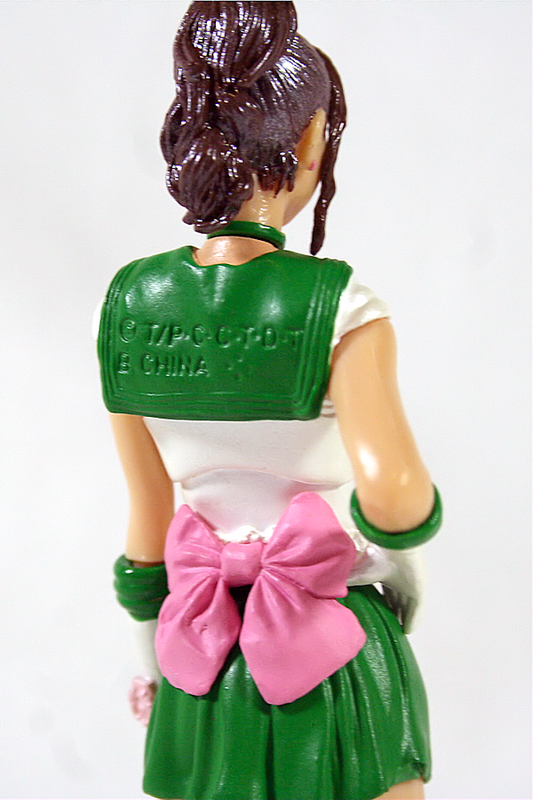 Details in her bow gem, and tiara are as neatly painted as they can be for their size. It’s actually quite impressive how smooth that gems gold detailing is. 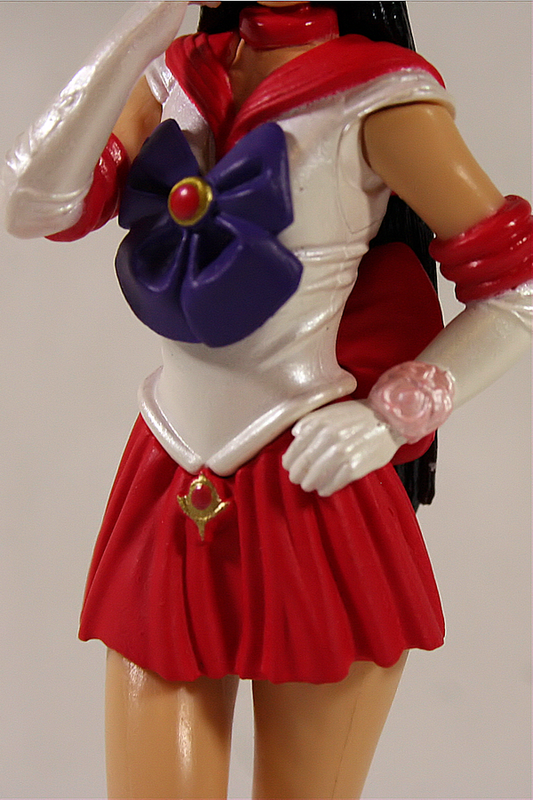 The rest of Mars seems painted cleanly, although mine appears to have issues with her right shoulder padding. There’s a small paint mark on her arm. This shouldn’t be an issue with all of them. The paint on Jupiter’s face is actually my favourite. It’s clean, happy, and energetic. They appear to have lacked patience on her hair baubles though. The paint job on her body is decent. There are no major flaws, and the only problem/inaccuracy I can see is that the loops around the pink beads on her waist should be gold. 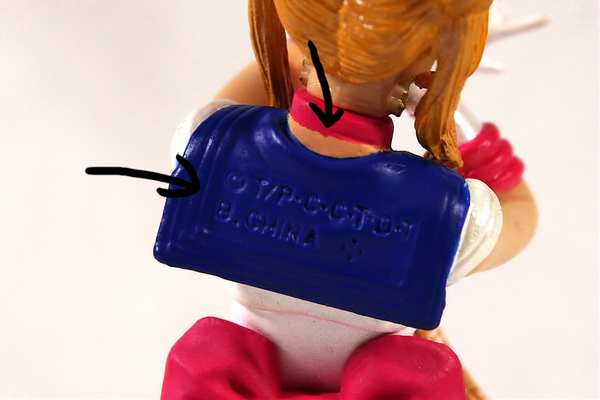 Considering the detail put into the other figures accessories it’s surprising they didn’t paint these details in. They do appear to have been a little messy with her bow gem as well. Venus’ belt looks nice until you look closer. There appears to be some details they got lazy with. There glove toppers are also a bit messy. Her face is horrible. Between her eyebrows and length of her hair, it doesn’t matter how the eyes and lips are painted, it looks weird. 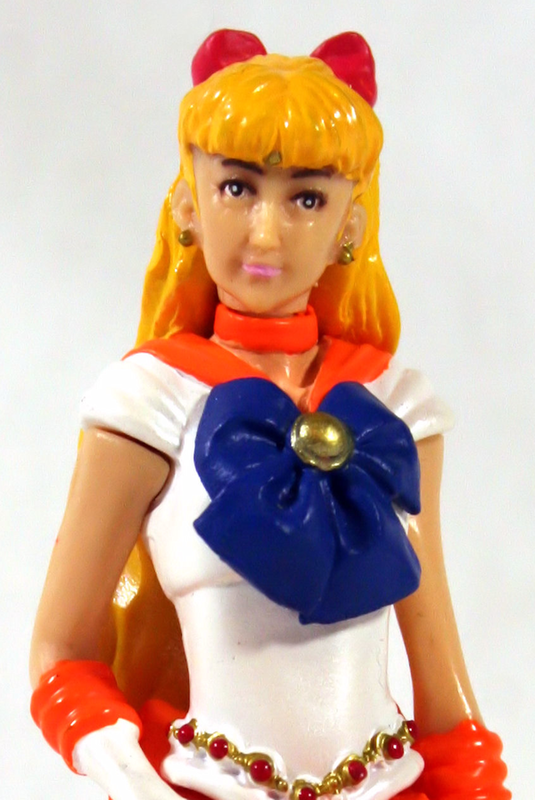 Her eyes appear to be looking in slightly different directions and appear of much less quality than others in the set. 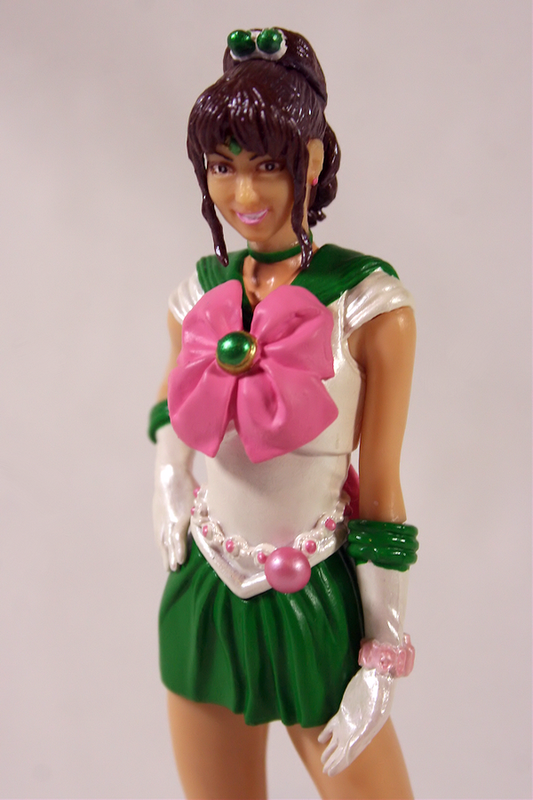 Compared to Jupiter’s face this is horrible. I recommend these figures to people who like PGSM, collect the series merchandise in general, and aren’t uptight about quality. These COULD be top notch figures, but fall just short of reaching their potential.